When ordering your window blinds, we ask you for your window measurements on the appointment card page. We only ask for one width measurement and one height measurement (drop), to get a general idea of the size and shape of your window. 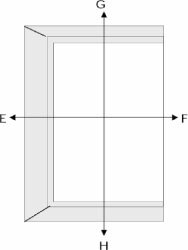 In reality, no windows are truly square-shaped or rectangle-shaped. Especially in older houses, the walls can settle and shift by up to an inch, which may not be noticeable to you but will slightly alter the shape of your windows. It is because of these subtle differences in each window that we take up to 9 measurements ourselves. Your nearest Trade Partner will visit your property to carry out this professional measurement service once you have requested an appointment on Luxury Blinds Direct, so you don’t have to worry that your measurements aren’t 100% correct for the order process. The first thing to do when measuring your windows is to first decide if you want the blind to fit inside your window recess, or hang outside the window recess. Do you want your blinds inside the window recess or outside the window recess? Your decision will depend on a number of factors. Firstly, look at how your window opens and closes. If your windows tilt inwards at the top, then they will disrupt blinds that have been fitted within the recess, so hanging them outside the recess would be better in this case. Inside the Recess: Fitting your blinds within the recess can be a neater option, but is sometimes not possible if the recess is very narrow. We would advise fitting the blinds outside of the window recess if your walls are particularly tilted, as accurately fitting them within the recess might be impossible due to the extreme wall tilt and could result in gaps that would let light in. Outside the Recess: Choosing to fit your blinds outside the recess can maximise your light entry, because less of the window is covered when your blinds are open. Another benefit is you have more room for error when deciding on the size of your blinds, ensuring they will completely cover the window. Blinds outside the recess will not interfere with any ornaments or decoration on the window ledge. However, blinds outside the recess can take up slightly more room, simply because they are not tucked away into the recess. They usually require around 10 centimetres of space above the window. Once you have chosen between a recess or exact fit, it is time to measure your window. 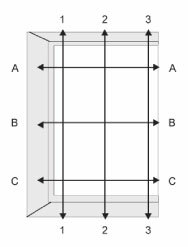 Your window will need to be measured a certain way depending on your choice, so please see below for further instruction. For blinds to hang outside the window recess measure the exact area you would like the blinds to cover, as shown below. To minimise any light leakage we recommend that the blind overlaps the window recess by at least 60mm (2.5”) at each side. Please note that with Roller Blinds the actual fabric width size will be 35mm narrower than the overall measurements you have given us. If you are looking to achieve a specific fabric size this 35mm should also be added on to the width. Measure the overall drop to include overlaps at top and bottom of the window; again it is recommended that these overlaps be at least 60mm (2.5”) at the top and the bottom. This gives the blind DROP. Check for any obstruction which might interfere with the smooth operation of the blind in this area, such as radiators. If you are having trouble measuring your blinds or need any assistance, please visit our FAQ page for advice, or get in touch with us via email: enquiries@luxuryblindsdirect.co.uk.